These preschool Bible lessons are created and used at home, so there are some basic preschool learning skills printables added to each post. The Bible lesson and Bible printables are suitable for home or Bible class use. This week we talked about the letter L and Daniel in the Lion's Den. This is a summary for Daniel & the Lion's Den for preschool and is found in Daniel 6. Daniel was a governor in the kingdom of Babylon for King Darius. Daniel was such an honorable person, that King Darius was thinking about putting Daniel in charge of the whole kingdom! Some other leaders were jealous and found a way to get Daniel in trouble! Daniel prayed to God 3 times every day in his upper room. There was a new law that said you could only pray to King Darius for 30 days. But, Daniel only worshipped the One God in Heaven! Daniel was thrown into the lion's den because he kept praying to God! The king was worried about Daniel all night and in the early morning, he hurried to see if Daniel was ok. But, Daniel told the king that God sent His angel to close the lion's mouths to keep Daniel safe. God protected Daniel and Daniel stayed faithful to God. Daniel let his light shine for Jesus. After I told the lesson, they retold me the facts. We used the file folder as a review. I let them add the lions and tell each other about Daniel. And, click here for this L is for Lion template. L is for Light: After talking about Daniel, we went over this mini-book. Each page has 'a Light' that God wants them (and us) to be for Him. How can they be a light? They circled the smiley on each page after we talked about it. These are great for coloring also and for an extra for Bible class. Click here to print. We made this L is for Lighthouse. Which I loved since I grew up by Lake Erie. You can also talk about Jesus wants us to be a light and what that means. Download the lighthouse here. We made this L is for Lamp. They loved painting the lampshade. You can find the free template here. L is for Ladybug, too! Click here to print it. I wanted to have them collect leaves outside, but it is the wrong time of the year. So, I purchased leaf stickers.. they love stickers anyway! You can download the L is for leaf worksheet here. Click here for the L is for Lion template. They love the Llama Llama books, so we did L is for Llama purchased from the set here. We also made these for them to take home. The L pages are going into an alphabet notebook for each of them to take home when we are done. I purchased the ladybug here. They had fun with this one! I glued a large craft stick to the back of the body so they could have their ladybug fly around! I found this Lion Craftivity in this packet. You can find more ladybug projects and printables here. There are lots of ideas and printables for L and Daniel here. We used the file folder game and I handed the lions out and let them retell me the facts about Daniel. 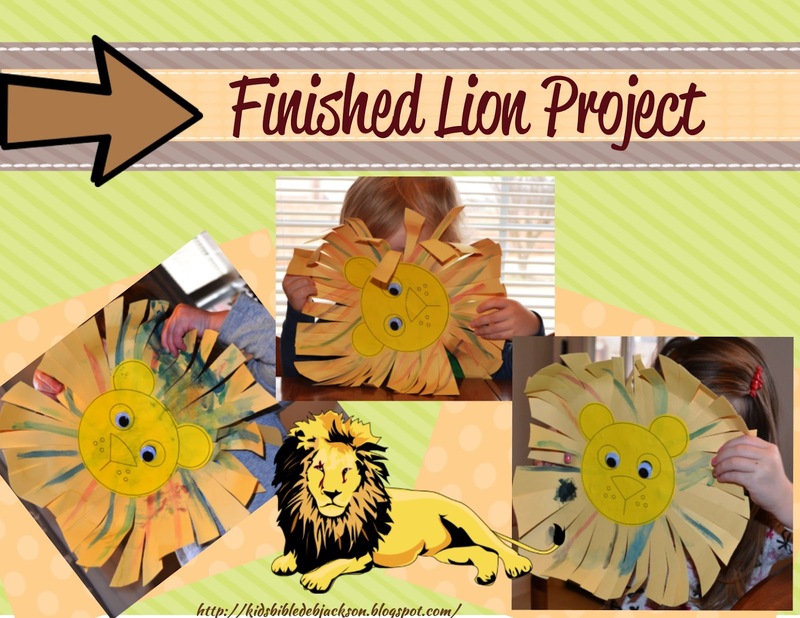 Another fun lion project is painting and cutting. You can see more including the directions here. You can see more on my L is for... Alphabet Pinterest board here. You can see more Daniel ideas on my Daniel Pinterest board here. Love your L is for Ladybug! What a clever idea! Thank you for sharing at the #Made4Kids Link Party!